Please, you know you read that as you were singing Phantom Planet. My favorite spots in San Diego are as follows and I assure you need to check them out if you haven’t. Oscar’s Mexican Seafood--THE best fish tacos, really. Snooze an A.M Eatery— I don’t even know how to form words to say about this place. Make sure you get there right when it opens, otherwise the line is down the block. And YOU HAVE to try OMG French Toast! It is honestly THE BEST you’ll ever have in your entire life. And you will dream about having this again. Your mouth will salivate every time someone mentions French Toast, and you will picture this beauty! I topped it off with a side of Bacon and an Mmh Mimosa. La Jolla Shores and Imperial Beach– just have a home feeling st these beaches. You run into many different types of people at both. Imperial Beach has this awesome boardwalk, and there was a pop up of shops heading towards the beach which had some super cute and unique things. La Jolla Shores has such a calm environment. And if you go up to Mt. Soledad you have some unbelievable views. And there’s such an amazing sunset you can watch. I just keep forgetting that the Pacific Ocean is cold. And I mean, my body is numb, and I can feel the frostbite happening… and let’s be real.. I live in Wisconsin… I know cold. Coronado–This is my heaven. It’s that “hidden” small town in a big city. I love every single thing about it Moo Time Creamery, seeing the boats, driving back to San Diego or towards Imperial Beach, just driving around looking at the houses, and end up about heading to the military base entrances (but this happened to us a few times on this trip, always by accident.). Walking around looking at the shops, and museums, and restaurants. 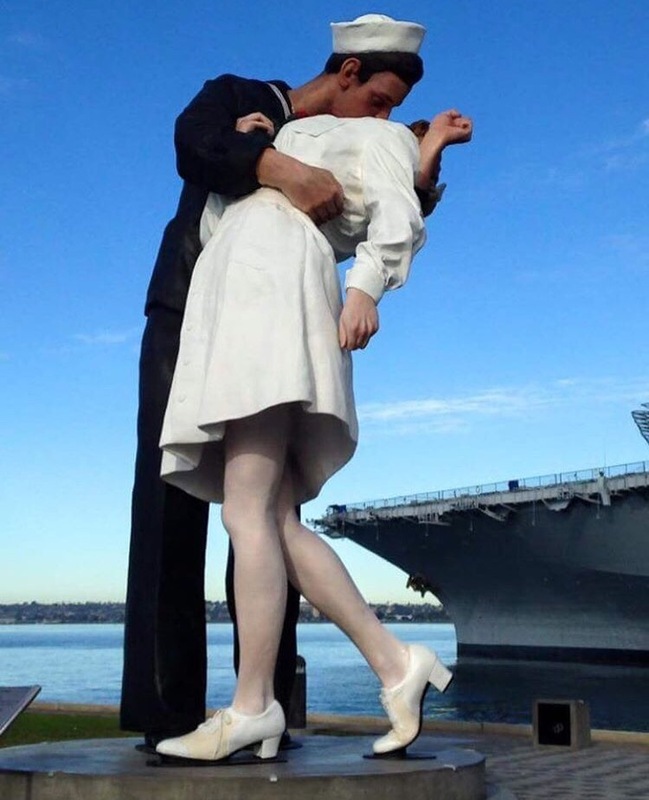 Unconditional Surrender–a must see. You just, have to go see it. Especially all you hopeless romantics, history lovers, and those with military affiliations. San Diego Zoo–It’s unbelievably ginormous! (And expensive, so I’d find a coupon if I were you!!) They have a Safari bus you can take that takes you around the whole zoo for the most part, we chose this route. However, it doesn’t take you to the Pandas, and, well, that is the only reason you’re coming to this Zoo in the first place! THEY’RE SOOO CUTE! Like humans in a bear suit. I just want to hug these adorable creatures. Also, even with a map and good sense of direction, we got lost in the monkeys, and took forever to find our way out. Nicky Rotten’s in Coronado–mmmmmmmmmmmmmhhhhhh. Just yum. Also, get the tots! Lion’s Share– Pricey, but they make their drinks strong and have an art decor that you just cannot stop staring at. Didnt try the food, but a full place, definitely gives me the right idea that the food is spot on. Wonderland- Brunch. Family Style. Phenomonal beach view.